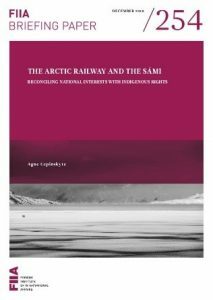 Finland and Norway are planning to build the Arctic Railway, stretching from Rovaniemi to Kirkenes through the homeland of the indigenous Sámi people. The state governments have acknowledged their duty to consult with the Sámi, whose culture and livelihoods the railway would affect, but the Sámi have dismissed the consultation efforts thus far as inadequate and have denounced the project. The dispute has exposed the ambiguity of the state’s duty to consult with indigenous peoples: international law firmly establishes the duty but does not prescribe specific rules for carrying it out. In Norway, the domestic regulatory framework concerning the consultation duty is more evolved and the practice of implementation is more consistent than in Finland, but both states still lack an effective legal incorporation of the duty. Despite the ambiguity, the scope of the consultation duty is determined by its purpose: creating favourable conditions to reduce power disparity between the state and indigenous peoples in order to reach an agreement that reconciles national interests with indigenous rights.